I have just order one of these boards via eBay. Now I'm looking for a suitable brick from the UK. One question, do you know if input voltage affects the efficiency of the board? Does it make much difference if I use an 18, 19 or 24V brick? Lower input voltage will give a bit better efficiency 19V, 19.5V and 20V are the easiest to find and will give you the best efficiency. I looked at eBay.co.uk and you can use this item number 400055514268 is 90W is 20V 4.5A and is used for DELL 2001FP LCD MONITOR it will work perfectly with Winmate PSU I also see this 390173558362 that is 20V 6A so 120W never seen before but it seems to be at the same price as the 90W model and it will be a better value. And finally there is this item number 150432897456 19V 7.9A 150W that will also work great. You just need to paste the item number in the eBay search field and you will see the item. I will probably need to build a list with compatible AC adapters but you can search for "AC adapters 4 pin" and you will find most of them. Thanks, for the pointers. I had been considering the XP POWER AEF100PS19 which has an efficiency of 93% but is very expensive. It make no sense to pay much more for the AEF100PS19, all recommended above are about 90% efficient so the 3% difference will never pay off. Sorry, I will build the cables and by next week they will be on sale as a kit. Did you list these yet? I'm not in a rush, so no need to hurry, but I also don't want to miss out when you do sell them. I started to make the cables but did not have time for the photos and maybe I will just sell them here on this forum since I do not have to many and people here are expecting this. It will not be fair to sell them on eBay to people that did not wait for this kit . 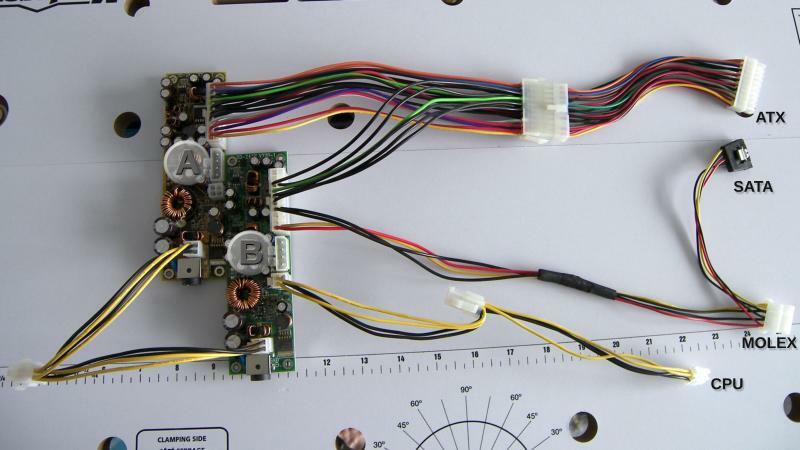 I will have a total of 7 kits like this but anyone can build this easy even without soldering. But for me is to much trouble and I do not think I will build more than this 7 kits that I will sell here on this forum. OK done you can see the details here Link for the dual PSU kit and they are ready to sell. Check out the 150W Liteon PA-1151-03MS (ebay Item number: 280397609323) http://cgi.ebay.com/LiteOn-19V-7-9A-150W-4Pin-AC-Power-Adapter-PA-1151-03MS-/280397609323?cmd=ViewItem&pt=Laptop_Adapters_Chargers&hash=item4148fff96b. Do you think the pin-out is compatible with Winmate? I could just get the 220W instead. Yes the pinout is OK at the first look I was thinking that the pinout is 180 degree rotated but is not so it will work with the winmate. Thanks for checking the pinout, I'll get that psu for my next build, but I went ahead and got the 220W, figuring to also run a 12V LCD from your board and consolidate wall pluggage, plus the 220W is a beast! Yes the 220W AC adapter is a good buy. I would like to ask you if there is any chance you will be selling also the DD-2412AX or DD-WP12AX-220 220W DC-DC power supply form Winmate? ... after this are sold i will be done so I only declare the income. This power supply is 4 to 6 time more expensive to import they are high quality product but I will not be able to sell this with over 100$. The ones I have I got at a good price from a canceled project, they were using this for a dialysis machine (so medical use). Post subject: Re: 220W DC-DC? I asked about the 220W version some months ago and the price for 50PCS was over 200$/PCS this was quoted from one of the distributors the Winmate dose not sell directly. You can even buy one but the price will probably be even higher and you need to add the shipping and it make no sense to pay that much for a power supply. I got this that I have for sale at a good price and even if I sell them cheap they are quite expensive to produce they have 4 Layer PCB (i never seen a 4 layer PCB on any other PSU), good quality components and a lot of qualification test since this are used in sensitive environment as industrial and medical computers. Sorry for answering so late but Yes it will work great as long as the voltage dose not exceed 28V. About your system I do not know the video card mid-range is not enough I need to know the model. As long as I stay under the total wattage is there a limit to the number of HDD I can use in a small nas powered by your psu? I imagine I'd need plenty of Y splitters for the molex/sata power?? How about multiple fans? no there is no limit as long as you stay under the max power the PSU. The Low power 3.5" HDD need abut 2A at startup on 12V so the max will probably be 6 HDD if you do not have anything else connected to PSU the Winmate can provide 10A continues on 12V and 12A for some seconds I did not tested with 6 HDD but it will probably work. This will use about 108W at load so you will need a PSU only for this so the other power supply will need to provide power for 3.4GHz AMD quad core probably 95W TDP do not know the exact model then is the motherboard (again do not know the model) but a guess will be 20W + 8GB RAM under 10W then there is the HDD and SSD probably to much for only two PSU at full load. I will suggest 3 PSU but you are also limited by the 240W ac adapter. It will work if you can undervolt the CPU or use a 65W TDP CPU. I just checked some reviews on 5770 and they measured 108W. Probably the power consumption depends on manufacturer and how they implement the GPU it also depend on how the power measurement is done. I did a little research and realise I would actually want a Y4, but I see where you say its not available. Could I get the 130w PSU and the 2.5mm panel mount connector and p4 cable (as in you attach the 2.5mm connector to the p4 cable). Will the following make a good adapter and at what voltage considering I would be using the p4 conector? Would I lose a lot in efficiency with the 220w if I only use 35-45w? I looked on ebay for a 4 pin 90 AC adapter, saw some sellers with the replacement 90w 2001FP, but I'm not sure which ones are reliable. It seems a bit expensive you can find on eBay an 120W to 160W AC adapter with the right 4 pin connector for 40$. Any voltage from 18 to 28V will work. You can ask me on eBay and I will search and recommend for you an AC adapter. The 220W is quite good so not to much maybe 1% or max 2% less efficient than a very good 90W AC adapter. The reliable one will be the original Dell. Hi Ksanderash glad you are still on this forum. He is talking about the 220W I used and reviewed here that is available from more than one seller on eBay from some time is 20V 11A great quality I use one right now. And the 90W for the Dell 2001FP monitor is quite common AC adapter that has the 4 pin Din connector 20V 4.5A but there are a lot of replacement AC adapter for this model and I do not know if all are good quality. I guess that embedded videos are not allowed. If is possible let me know how. Post subject: Re: Fanless 130W ATX PSU with 120W AC adapter *Video. I think I answered you directly the ATX power supply can not be used to supply power to this since they need a minimum of 18V at the input.